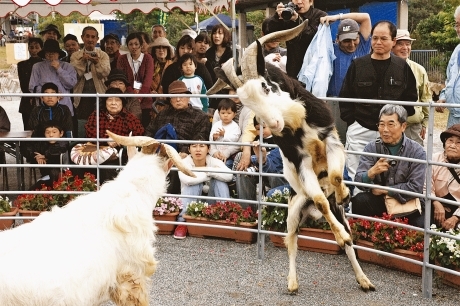 On March 12, many people came to enjoy a goat-fighting, or Hijaorase (Okinawan dialect) event, held annually at the Katsuyama Community Center, Nago City, in the northern part in Okinawa. Two goats butted each other violently in a ring approximately six meters in diameter. The goats lifted their front legs up and swung their horns down on to each other repeatedly with a loud whack. The spectators sitting on the other side of a fence around the ring were enthralled by the contest. Yokozuna (Grand Champion) Shikuwasa, aged six years old, met the challenge of his three year-old son Sandaguwa in the main bout. Despite the youngster’s physical superiority, Shikuwasa maintained his dignity, defeating his son using his well-refined fighting technique. During the opening ceremony, people offered a silent prayer for those who perished in the earthquake and tsunami that occurred in the northeast of Japan on March 11. Spectators also gave donations for the disaster victims.